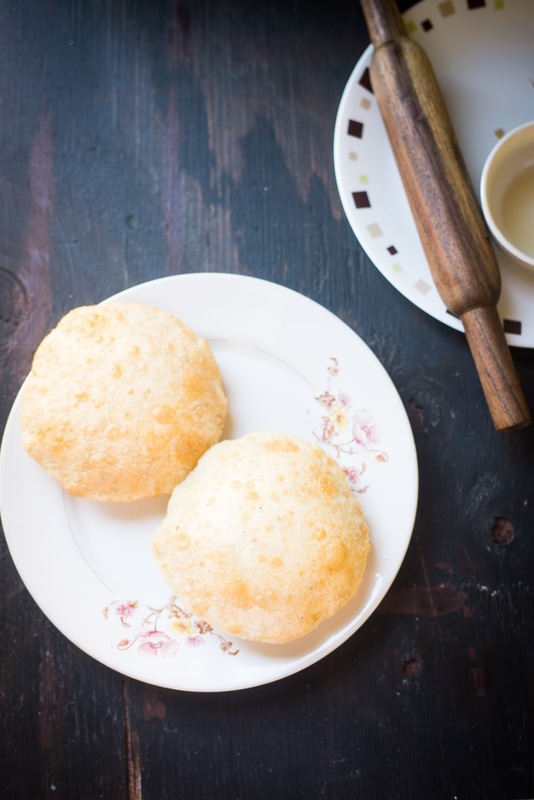 Once upon a time, when my mother used to make Luchi (similar to famous Indian dish Puri) I used to wonder how she can make every one of them puff so nicely. Couldn’t imagine that one day I will also be popular as master of this expertise among my friend circle. Most of my friends in San Diego can die for Luchi with mangsher jhol (chicken or mutton gravy) or Aloo Dum and I feel very happy if I can prepare the same for them in my party. 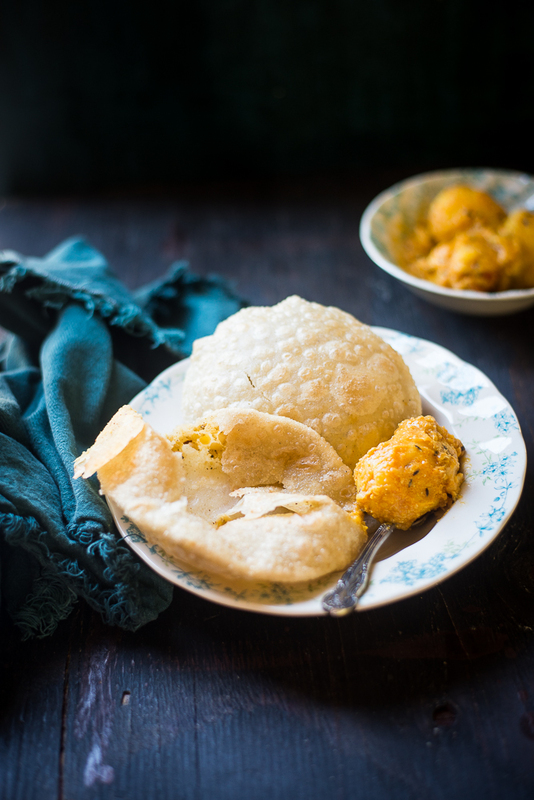 Today I have got a stuffed Puri recipe, called Radha Ballavi. It’s deep fried like a Luchi or Puri but stuffed with spicy urad daal filling. 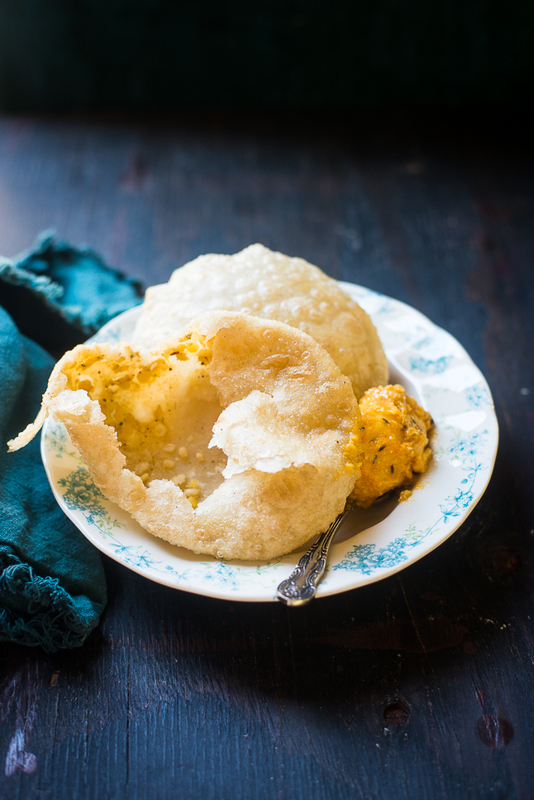 Often they are bigger than normal Puris in size and served with Dum Aloo or Cholar Dal. 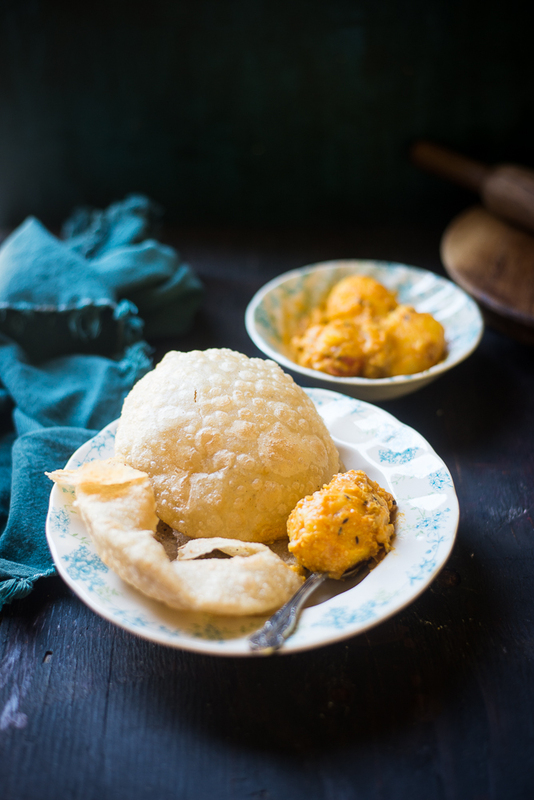 This is a very traditional Bengali dish, commonly available in sweet shops, served as breakfast or snack. When north-Indian Naan or Kulcha didn’t become a status symbol in the Bengali wedding, this dish used to be served along with Pulao in most of the weddings. Generally, Radha Ballavis are not made at home and left to the professionals of the sweet shop or the Chef appointed to cook for a wedding. However, neither we can go to a sweet shop nor can attend a wedding in abroad, so only way to enjoy this tasty delicious item is making it at home. 1. In a wet mixer grinder add the urad dal, ginger, fennel seeds and green chili. Make a paste. 2. Heat one or two tablespoons of oil in a non-stick pan. Add hing , then add the Urad dal paste to it. Add salt and keep stirring the paste and cook it until a thick dough is formed. Once done, add bhaja masala and allow it to cool. Stuffing is ready. 3. In a big bowl, take maida, salt, and oil and mix them well. Now gradually add water and knead it for at least 7 to 8 minutes and make it a dough. The dough should be soft enough but still firm. Once it is done, keep it covered with a damp kitchen towel. 4. Make some big lemon sized balls from the dough. 5. Flatten a ball into a disc of about 2 inches by using your palms. 6. Place one big teaspoon of stuffing in the center of the flatten dough, cover the stuffing by bringing all the sides of the disc together and make a ball again. 7. Slowly press down with the help of a rolling pin to roll out the ball and get a small circle like puris. Prepare all the puris in the same way. 8. Heat oil in a deep frying pan. Once the oil is hot, keep the flame on medium high, put the Radhaballabhi in the oil one at a time. Toss it carefully and fry it with the spatula, till it becomes golden on both the sides. 9. To puff it up, you should lightly press down the sides of the Radhaballavi with the spatula and always control the heat of the oil by increasing or decreasing the flame. 10. Remove the fried RadhaBallabhi with a slotted spoon and place it on a paper towel to drain the excess oil. Serve hot with Dum aloo / Aloor dom or Cholar dal.